This safety bagel slicer does the cutting job quickly and easily, with an extra dose of protection. A stainless steel serrated blade is surrounded by a plastic guard can help prevent accidental cuts—and evenly slice your bagel. It’s a favorite in The Grommet kitchen and works on buns and other breads, too. Makes it very easy to cut bagel. Cut through it like butter. Makes it easy to cut in equal sizes. 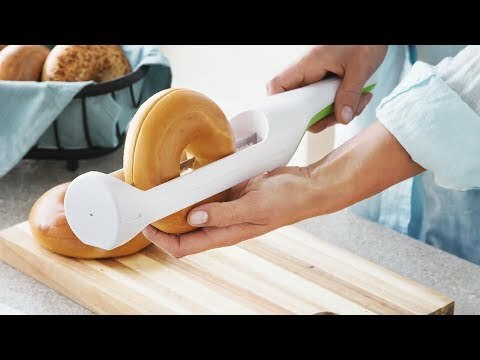 I love this gadget.... it cuts the bagels & even cuts rolls. Fast convenient & easy to clean. I have used a variety of knifes, and slicers and tjis is the best knife i have used. I highly recommend this product. Works really well without any cut fingers. Even my 5 year old niece can use it on her bagels. 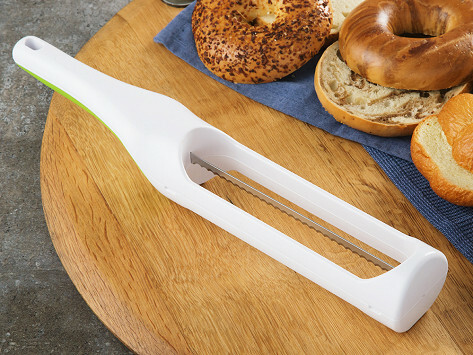 Hometown Bagel Knife is a bagel slicer that does the job quickly and easily, and with added safety in mind, too. The serrated blade is built inside a plastic guard that can help protect hands during slicing. Besides boosting safety, bagels are evenly sliced in half. The knife works on rolls, biscuits, English muffins, and other breads. And the BPA-free plastic and stainless-steel knife is dishwasher-safe. The Hometown Bagel Knife has improved our weekly Bagel Mondays, and we think it’ll streamline your slicing action, too.